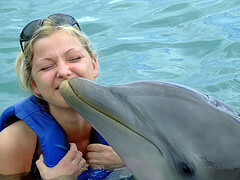 Dolphin Cove Jamaica - Here's Why I Just Love It! Where can you find a combination of animals, water, great staff and fun, fun, fun? 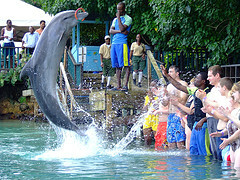 It’s the Dolphin Cove Jamaica Attraction operated by Chukka Caribbean. Dolphin Cove, as its name suggests, is a cove on Jamaica’s Northern coast specifically in St. Ann and of course you will find beautiful bottle-nosed dolphins there. The attraction is in close proximity to several hotels and accommodation. It is also well known and is therefore a staple on the itinerary of most tour companies. Dunn’s River Falls and Mystic Mountain attractions are also close by so it’s a great way to do a double or triple visit on one trip. Reasons I Love Dolphin Cove! There are several reasons Dolphin Cove is a haunt for locals and visitors of all ages. Here are my top 4 reasons for just loving Dolphin Cove. The dolphins - The dolphins are the main attraction there were about 4 on the day I visited. It was a wonder to see these large beautiful creatures splashing and dancing as they majestically synchronized their movement under the guidance of the trainer who was more like a dance choreographer. They seem to enjoy performing as well as petting from those visitors who swam with them. My son and I (both non swimmers) even got to touch one as it swam by the viewing deck. Very cool! The shark show – Friends this is a must see. It was absolutely fascinating to watch as the handlers daringly touch the sharks or stand in the water with these deadly creatures singing and dancing as they did their performance. Whew! My students were in absolute awe. Very friendly and informed team- from the sales team at the reception area right down to the tour guides there is a feeling of welcome that exudes as soon as you arrive and the tours is interesting because the guides are well informed. Cool, tranquil surroundings – Water used in the shower and hand washing areas come through bamboo taps from the Dunn’s River -a novel way to utilize Mother Nature’s gifts. The vegetation is lush and green and the climate is oh so salubrious. Ahh! The beach- Wow! The wave action is high but don’t worry the waters are quite shallow and extremely warm. What else will you find at Dolphin Cove? Outside of the dolphins and sharks there are birds, reptiles and sting rays. Plant life – The attraction is well shaded – for the most part- by a blanket of trees which forms a beautiful canopy even on the beach. I loved it. And there are beach chairs if yoy just want to chill. The pirate – I actually got “held up” at “gunpoint” by the eye-patch, earring wearing and realistically costumed ‘pirate’ a definite LOL!! Do follow the guides’ instructions and the signs posted. Do dress comfortably especially if you plan to walk the nature trail. Do plan to swim in the adjoining beach the water is just fabulously enticing. Do be careful around the shark pool- you definitely don’t want to fall in. 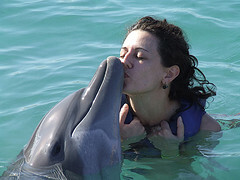 Do share a kiss with a dolphin – I’m sure your partner won’t be too jealous! Don’t ignore the safety rules. What will you remember most about Dolphin Cove? Well that is dependent on what you did really. But I think you will remember the dolphins, the parrot, the pirate, and the beach but hey feel free to create your own list.